The construction of the Don Sahong hydropower project in southern Laos’ Champasak Province has cut off a main fish migration channel in the Mekong River, compromising the livelihoods of millions of people along the river basin. Don Sahong is an island in the Siphandone area of Champasak. Once part of the Bolaven Plateau, Don Sahong, along with thousands of other islands in the area, was formed after the plateau was flooded with water from the Mekong River, leaving only elevated parts as islands. From here, the river is divided into countless tributaries, canyons, and falls before joining up once again to flow a few kilometers downstream into Cambodian territory. The naturally rugged terrain typical of this area would have been an impossible challenge for fish migrating upstream during breeding seasons, had it not been for a calm waterway that weaves its way between the islands of Don Sadam and Don Sahong, connecting the mainstreams of the Mekong River. The Hou Sahong channel, as locals call it, enables year-round fish migration through the Mekong River and provides food and livelihoods for millions of residents living along the river basin. But the channel is no more after work on the Don Sahong hydroelectricity dam began. Lao KPL News reported that the commencement ceremony of the construction of the Don Sahong hydropower plant took place on August 16, despite actual work on the project having started more than a year earlier. For months, constructions have been finished on two blockage dams on either side of the Hou Sahong channel to connect Don Sahong and Don Sadam Islands. As of September 2016, a vast area of the Hou Sahong channel and nearby forest has been cleared to make way for the dam, leaving nothing but the dry and lifeless river bottom. The 260MW hydropower plant, 32 meters in height, has been the subject of constant criticism from international experts, who denounced the project for blocking the migration passage of fish that swim upstream for breeding. The Don Sahong dam is situated on crucial wetland conserved under the 1971 Ramsar Convention with over 160 contracting parties along other areas such as Stung Treng in Cambodia and Tran Chim National Park in Vietnam. While Cambodia signed up to the Ramsar Convention for Stung Treng, the Siphandone area lacks any protection across the border inside Laos. The International Union for Conservation of Nature asked Laos to sign up but the country declined to sign the Ramsar Convention, as their priority was to build a dam and also a special economic zone. The Lao government ignored the Procedures for Notification, Prior Consultation and Agreement (PNPCA) with other countries in the Mekong River Commission (MRC), of which Laos is a member, saying that the dam’s location was not a part of the mainstream Mekong River. Laos is also accused of bypassing prerequisite environmental and transnational impact evaluation prior to commencing the hydropower plant’s construction. It does not take long for the negative environmental effects of the dam to take place, as locals in Champasak Province have already experienced a 90 percent loss in the amount of fish caught even in the height of the flood season. According to a 2010 strategic environmental assessment by the International Center for Environmental Management (ICEM) on hydropower on the Mekong mainstream, the Don Sahong project would have negative impacts on the fish resource along the Mekong River, most significantly in Cambodia and Vietnam. The developer backing the Don Sahong dam is Mega First Corporation Berhad, a Malaysian company which also owns the British Virgin Islands-incorporated Don Sahong Power Company, one of the contractors of the project. Building materials for the project are provided by Chinese contractors Power China and SinoHydro, which also take part in the construction. 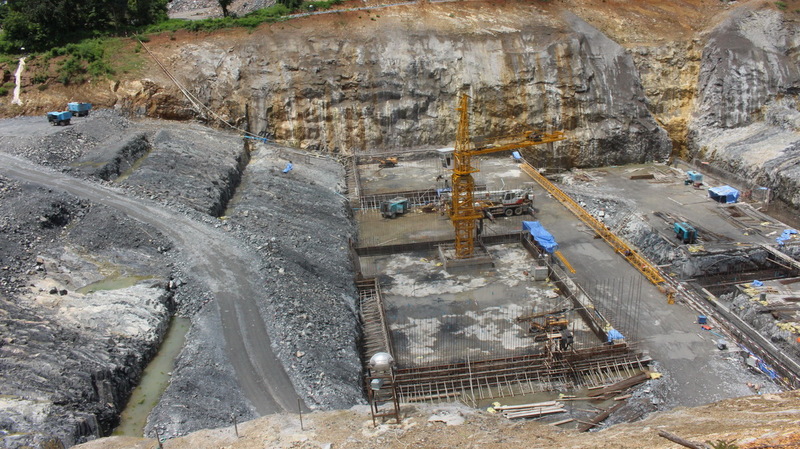 Don Sahong is Laos’ second hydroelectricity plant on the Mekong River under construction, after the Xayaburi plant in northern Vientiane, out of its planned 11 projects.